32.8 million members. 4,138 State Chamber Seats. 238 House Seats. 51 Senate Seats. 33 Governors. 19 Presidents. 1 Party. It’s no question that the Republican Party has a strong influence on modern-day America, as well as left a timeless legacy. However, whether or not the GOP can sustain this influence depends on several factors. One major factor is how weak the GOP has performed in urban areas of the US. Above is a map of the 2016 General Election by Brilliant Maps. The map makes the election appear as a sweeping GOP victory. If you look at the areas of blue, however, you will notice that they are all major cities. Los Angeles, San Diego, NYC, Houston, Miami, Boston, Detroit, Chicago, and many more were all lost to Hillary Clinton. These areas have the highest population density in the country. Trump won enough electoral votes to secure the presidency but the strategy used to win past GOP elections will be ineffective as the country moves forward with urbanization. The urban areas of the country are where the election power is concentrated the most. These are also the areas of the country where liberalism thrives, making it easier for the Democratic Party to win elections in these areas. The Electoral College has done a good job of evening out this concentrated power at the federal level for hundreds of years. One of the beauties of the electoral system we have is that cities do not dictate the direction of the whole country. But cities are continuing to grow and as the cities grow so do their political influence on the rest of the country and their respective states. According to the Census Bureau, the urban population grew 12.1% from 2000 to 2010, outpacing the national population growth rate of 9.7%. Democratic election power is increasing. More people are moving into America’s cities which is affecting the electoral performance of Republicans at the Federal, State, and Local levels. New York is an example. New York appears to most as a Democratic stronghold but this is only partially true. 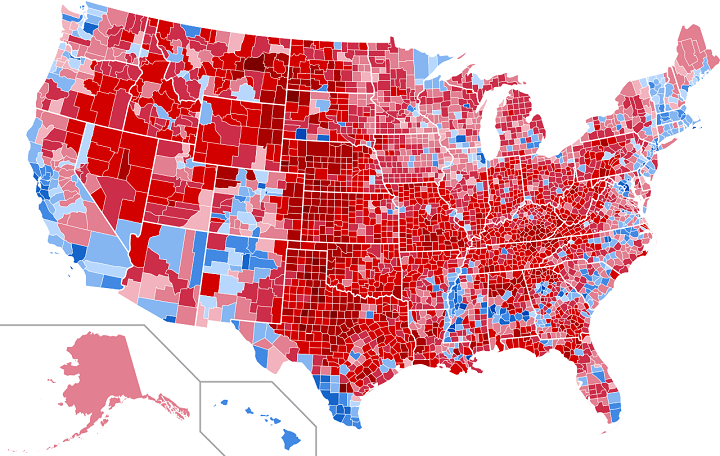 Above is a 2016 presidential election map by county, with red counties voting in favor of Trump and blue counties voting for Clinton. at a glance, this map can be very deceiving. New York was a victory for Clinton. The blue areas of the state happen to all be located in our major cities, New York City is the largest city with the most pull. Other blue cities include Albany, Syracuse, Buffalo, and Rochester. These red areas of the state used to keep the State Senate and Assembly as well as the Governorship balanced, but this balance has shifted drastically. New York’s cities are growing in population. The initial sign of the shift in the balance happened in 1974 when the New York GOP lost control of the State Assembly, which is the lower chamber of New York’s Legislature. They have not been able to secure a majority since. Up through the 1990’s, the State Senate was a safe red chamber of the state government. But even that is about to be lost with only one Senator keeping the GOP as the majority. So many Senate districts are in the city due to the population concentration. With the State Senate lost, the whole state will be controlled by the NY Democratic Party. This is not exclusively a New York problem, either. Even Texas has seen a rise in blue influence, particularly along the rapidly developing southern border. California, the home of Ronald Reagan, is now almost entirely blue with the exception of parts of eastern and northern California. The GOP is underperforming in urban America. The problem is GOP performance in our cities. The GOP does not have good optics in many urban areas of the country. If the GOP is to continue fighting for freedom, low taxes, and the free market, its influence must better capture young people in cities. First, they must understand the Millennial and Gen-Z generations. They must understand what is important to young citizens and their culture. Democrats have had a cultural advantage. New and infused cultures are born in cities. Cities are the melting pot of the nation. Cities are Democratic strongholds; the party has a strong understanding of what is important to young people. According to Pew Research Center, 57 percent lean towards the Democratic Party compared to the 36 percent that lean Republican. If this statistic isn’t an eye opener, I don’t know what is. There are several different types of people living in cities. Some are career driven entrepreneurs, venture capitalists, and doctors. Some are hard working blue collar men and women like firemen and corner store owners. Others are young college students, entry-level workers, and interns. There are several reasons one might be drawn to the city. For the businesswoman or the doctor, it might be career moves and economic opportunity. For the fireman, it might be an urge to help the community or be near family. For the young college student, it might be exciting city nightlife and cultural diversity. No matter who the person is, they are usually financially conscious, as city life isn’t cheap. It is for all of these reasons that conservatism is an urban value. Cities are why conservatism has to live. To assist in this analysis of conservatism’s place in cities, I interviewed two urbanites who are city conservatives themselves. Shoshana Weissmann and Sarah Quinlan are both strong voices among the conservative movement and bring in unique perspectives when on the topic of city politics. Shoshana Weissmann manages digital media for the R Street Institute where she also works on occupational licensing reform, among other issues. Sarah Quinlan is a front-page contributor for RedState. Both are vocal urban conservatives who hope to ignite change in America’s cities. Republicans must show urbanites the benefits of fiscal conservatism. The GOP needs to better pinpoint what matters to urbanites and show them why conservatism is a value that they possess. Lower taxes help everyone, especially in (“yuge”) cities like New York City. Conservative values are American values, according to Sarah Quinlan. “The principles promoted by the conservative movement – such as limited government; the free market, free trade, and capitalism; personal responsibility; liberty and freedom – are applicable to all Americans and make all Americans more prosperous, and that should be a winning message.” I couldn’t agree more with this statement. Lower taxes make it easier for the corner store clerk to feed his kids and for the start-up business owner to afford her office space. Fewer business taxes and regulations make it easier for the baker to be able to open the cafe of her dreams and for contractors to build beautiful buildings to add to the skyline that city-goers crave. Lower taxes will spark the economy to actually raise tax revenues to be able to replace the MTA rails that have needed replacing for decades. Economics has always been a strength of conservatives, it is just a matter of applying it to these people’s lives. Urbanites like what Democratic leaders have to say because tax hikes and financial burden aren’t mentioned. Republicans must embrace urban culture. Urban culture is something extremely unique about cities. America’s cities often have highly dense populations. Sarah Quinlan makes the point that America is a melting pot and that cities really expose this. “America is a country created and formed by immigrants, and there is no better reminder that America is a “melting pot” than when one walks down an NYC street and hears multiple languages from all across the globe being spoken,” says Quinlan. I also echo this sentiment. Cities are teeming with people of all kinds and allow you to explore different cultures, unlike any other place. These populations are often from all over the country and even all over the world in many cases. Unlike rural and suburban areas, these people often don’t know each other. Cities are huge populations of people who are stranger to each other and live completely different lifestyles. Diversity is the best word to describe the population within cities. People of all races, social classes, economic classes, cultures, and backgrounds, as any well-functioning capitalist society has. With all of this being said, Republicans often push it away and demean urban areas of the country. Sarah Quinlan points this out saying “On a national level, I believe the Republican Party makes a grave error by placing so much focus on rural America while expressing contempt for urban America. Since the 2016 election, many people associated with the Republican Party have continued to declare large, less urban swaths of the country as “real America” while deriding larger urban centers as out of touch with the values of the rest of the country.” Urbanites can’t feel welcome in the GOP if our national leadership is pushing them away. Rather than pushing those who live differently than us away or suggest how they should live, we must embrace cultures of all kinds. There is no doubt when looking at our history that the GOP is a defender of freedom and liberty, we must remember this heritage moving forward. Pulling in more millennials, minorities, and left-leaning citizens will require us to show them how capitalism and the constitution promote diversity and equality. Another point brought up by Shoshana Weissmann is that we often push concerns of urbanites under the carpet and deny that they are indeed problems. A major example is inequality. “Republicans always say that government is hurting people and not letting people compete but deny that inequality exists. Even if created by the government, inequality still exists and we still have to address it,” says Weissmann, specifically regarding occupational licensing. Inequality does exist, it just simply isn’t the way that the left leads you to believe. The government creates inequality much of the time rather than fighting it. The GOP needs to take action in US cities. Lastly, we need serious Republican contenders running for office in cities. A problem in cities that Shoshana Weissmann identifies is that Republicans don’t take Republicans running for office seriously enough. Our problems with performance in cities are often “self-inflicted” and much of it has to do with the fact that we don’t take ourselves seriously. Nicole Malliotakis ran against Bill de Blasio for Mayor of NYC in 2017 unsuccessfully. Though she performed well in certain parts of the city, particularly Staten Island, much of the city and even members of the GOP did not take this outstanding Assemblywoman as seriously as she deserved. Often there isn’t even a Republican running for certain positions. Empty race seats lead to a 100% democratic victory every time. We should leave no seats unfilled. Another way to improve performance in our cities is to take policy proposals and tailor them to city values. Republicans that do perform well in blue cities like Dallas do it by changing their messaging and tailoring policy proposals. Taking a center-right approach to campaigning and policy works well for city Republicans across the county, namely Dallas Texas. The blue city of Dallas has a notable Republican presence because of politicians who promote fiscal conservatism while also being socially tolerant. The GOP should not only invest more time, money, and resources into cities, but they should also strive to build an urban Republican culture. Many conservative Republicans living in cities are discouraged and don’t know where to start when it comes to turning things around. However, there are things that can be done that don’t necessarily involve running for office. Sarah Quinlan advocates for embracing conservatism in your social circles and verbally identifying as a Republican. “Don’t be afraid to take the first step and admit your political beliefs – you will likely find that others agree but are simply too shy or reluctant to be the first to publicly admit as much. You can embolden them to speak up and get more involved,” says Quinlan. Shoshana Weissmann suggests using your resources and means in order to contribute to campaigns. “Getting involved on the local level is important. If you have the means, donate. If you have time or skills, help campaigns in a way that will add value.” says Weissmann. Don’t feel as though voting in elections in your city isn’t worth it. As a matter of fact, help the candidates in your city run. Knock some doors and make i360 calls. Distribute yard signs. Do anything you can do or are willing to do to help candidates run for office. We should also be leaving no ballot lines unfilled. What this takes is more urban Republicans running for public office. The right candidate doesn’t have to be a lawyer or doctor, either. The right candidate could be you. Whether it is City Council, State Senate, or Congress, don’t be afraid to run for office. Weissmann also stresses the importance of running community leaders. If you are running for office, it is important to be involved in the community around you. Get to know your city and its constituents. It’s time for action in urban America. America is growing. Our GDP is growing. Our population is growing. Our cities are growing. The GOP is losing influence on Millennials and cities. The GOP has work to do, but Republicans can’t back down from this fight. The key lies in embracing conservatism. I’m an urban Republican and I am excited to fight for freedom, fiscal responsibility, and civil liberties in our cities. I encourage you to do the same. The shining city on top of a hill that Ronald Reagan spoke of in his farewell speech exists, we just need to reclaim it. Nick Lindquist is a Junior at Le Moyne College in Syracuse, NY where is pursuing a Bachelor’s Degree in Marketing with a minor in communications. His passion for politics began during the 2012 election cycle, inspiration coming from the Mitt Romney for President Campaign. Nick continued to live out his passion by joining the 2016 John Katko for US Congress Re-election Campaign. Nick is driven by a passion for politics but also by in engaging in marketing and entrepreneurship. While serving as a DECA Officer for ESM High School and New York’s 9th Competitive Region, he competed in two international DECA Conferences and organized a number of various projects and events. Later, Nick started his own company, using the skills he learned as an officer to produce and enact strategic visions to create success. Nick hopes to unite his passions for business and politics into a driving force for change. In his free time you can usually find Nick on a hiking trail, reading about US History, spending time with his friends and family, or playing with his dog.